Matching up with the exact requirements of customers, we are involved in presenting a wide array of Subsonic Wind Tunnel. - 15HP Air Compressor to develop maximum pressure of 25Bar. To study of boundary layer around objects, pressure distribution around cylinder & aerofoil and measurement of lift & drag force over aerofoil. 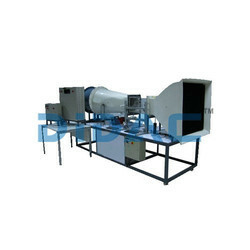 The wind tunnel is a ducting designed to produce controlled airflow conditions. It can be used for studies of air flow around objects. We are one of the eminent organizations engaged in providing our clients with a comprehensive collection of Cylinder And Flat Plate Models. All our products are developed using premium raw material to ensure that these meet industry norms. Moreover, our systems are available at market leading prices and can be customized as per the specifications detailed by the clients. Advanced Technocracy Inc. is Manufacturer, Exporter & Supplier of Aerodynamic Tunnel.